At least 26 people are dead. Millions lack power. Property damage could reach $20 billion, according to early estimates. This is a time for rescue, recovery, and rebuilding. If you want to do your part, you can donate to the Red Cross here. But, with the presidential election less than a week away, this is also a time for politics. The central debate of the campaign has been about the role and size of the federal government. Nothing could shed light on that question more than an unfolding natural disaster. Seven years ago, when Hurricane Katrina struck New Orleans, we saw what happens when the federal government fails to respond to catastrophe. Devastation was inevitable, given the nature of the storm and the geographic idiosyncrasies of New Orleans. But the Federal Emergency Management Agency (FEMA), ensnared with ambiguous lines of authority and hobbled by incompetent management, was slow to respond. Particularly in the critical days after Katrina struck, overwhelmed local and state officials couldn’t get the help they needed. Those failures prompted a serious effort to reform FEMA. Congress clarified the agency’s authority, which had been muddled ever since the creation of the Department of Homeland Security following 9/11. Under a new law, the administrator gained cabinet status, complete with direct access to the president, during emergencies. The new laws also gave FEMA the ability to provide money and assistance earlier, even before formalized requests from local and state officials. In 2006, President Bush replaced Michael Brown, an unqualified political crony, with the highly regarded David Paulison, former head of fire-rescue for Miami-Dade County. Upon taking office, President Obama selected as Paulison’s successor Craig Fugate, who had been Florida’s director of emergency management and won praise there for his handling of multiple hurricane emergencies. Fugate already was in motion before the winds died down from the late April barrage of tornadoes, which so far have claimed at least 329 lives in seven states, caused between $2 billion and $5 billion in property damage and reduced more than 10,000 homes to kindling. … Fugate knows the value of racing the clock and cutting the red tape when Mother Nature strikes, having dealt with the destruction left in the wake of seven hurricane landfalls in Florida in 2004 and 2005. Within hours of the tornadoes, Fugate and his FEMA teams arrived in Alabama, quickly opening disaster recovery centers to assist residents with financial aid, food, water and shelter. … Under Fugate's leadership, an unimaginable natural disaster literally has paved the way for a textbook lesson in FEMA crisis management. It is, indeed, in stark contrast to the Bush administration's response to Katrina. …. To this point, where the federal response is concerned, there's little to criticize and much to praise. That's very encouraging, indeed. The federal government’s response has been great. I was on the phone at midnight again last night with the president, personally, he has expedited the designation of New Jersey as a major disaster area. … Last night, I was on the phone with FEMA at 2 a.m. this morning to answer the questions they needed answered to get that designation and the president has been outstanding in this. The folks at FEMA, Craig Fugate and his folks have been excellent. the whole time I was there, a FEMA representative was on site, helping with preparations—including coordinating assets from unaffected states that were brought to Maryland for help. We also had a liaison from HHS to help with medical issues. But if FEMA turns out to be a story of what government has done right, the damage to infrastructure could be a reminder of what government has done wrong—or, more precisely, what it hasn’t done at all. You don’t have to spend much time on the internet to find stories about the inadequate state of infrastructure in New York and the entire Northeast. Here’s an article from November, 2010. 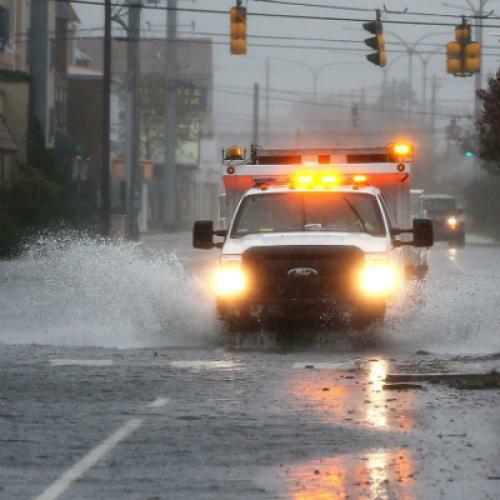 Here’s another, written after Hurricane Irene last year, about the need to upgrade the city’s plumbing and “soft infrastructure.” A 2008 survey of civil engineers revealed serious deficiencies in wastewater and roads. Experts have been saying, for years, that the nation’s power grid needs updating. "The northeast is probably the oldest part of our power system," says Clark Gellings, a fellow at the Electric Power Research Institute. "It was the first place where power was installed and a lot of that equipment is still very old." A massive storm like Sandy is going to cause devastation and disruption, no matter how good the infrastructure. As Gellings notes, "electricity and salt water don't mix." But, with better infrastructure, communities can be more resilient. Power lines can survive wind when they are underground. Sewers won’t spew wastewater into rivers if they have sufficient capacity. Forward-thinking local and state officials find ways to shore up infrastructure even in lean times: Just two weeks ago, New York City officials announced a plan to accelerate about $1 billion worth of projects, by taking advantage of presently low interest rates (which make borrowing cheaper). But that kind of thinking has been absent in Washington. The Recovery Act included substantial infrastructure spending and, as Michael Grunwald documents in The New New Deal, those investments will bolster everything from transportation to energy generation. (Gellings reminded me that the Recovery Act included money for "synchrophasors," which allow utilities to respond to outages more quickly, although it's not clear how much they would help in a disaster like Sandy.) But there is much more to do. And, notwithstanding testimonials from some of the nation’s most respected economists, citing the same low interest rates, efforts to borrow money for infrastructure have run into massive resistance. In Congress, Obama’s proposal for an infrastructure bank, as part of the American Jobs Act, was dead on arrival. All of which brings us back to the presidential campaign—and Romney’s now infamous suggestion, during a 2012 Republican primary debate, that he might eliminate FEMA altogether. Reasonable people can disagree about what exactly Romney intended to say in that exchange. (With Romney, and his carefully worded statements, you can never be entirely sure.) But, as Kevin Drum and my colleague Alec MacGillis observed, it’s typical of the “glib federalism” that has become mainstream Republican dogma. As this theory goes, anything that Washington does, states (or the private sector) can do better. The truth is quite different. States do many things well and, frequently, the most successful federal programs are the ones that let states innovate or take charge in those instances when they are positioned to do so. Emergency management happens to be one of them: Fulgate’s mantra at FEMA is to let states take the lead, with the federal government giving them the tools to do their job. But even programs like FEMA require presidential-level commitment to a vibrant bureaucracy and, yes, serious federal spending. And that’s not something Romney, or his allies, endorse. On the contrary, one of Romney's core campaign commitments is a cap on federal spending that would require drastic cuts to domestic spending. If Romney sought to spare FEMA, as he has other popular programs, that’d simply mean more cuts to other programs—from food inspections to health clinics to air traffic control—on which public safety and well-being depend. So far, Romney and his allies haven't suffered politically because of their boasts to shrink or abolish federal agencies. Government, in the abstract, doesn't get a lot of love from the voters. Maybe Sandy will remind people that it should.